This year, there’s an interesting little twist on the traditional Christmas Tree that’s certainly not the norm, and it’s catching on like wildfire… it’s the Upside Down Christmas Tree! It’s actually not as crazy as you might think. This is how it was originally done back in the day… Christmas trees were hung upside down from the ceiling as a sign of Christianity. Today, more and more Americans are enjoying the novelty of it by introducing an Upside Down Christmas Tree into their homes during the holiday season. Some, as their primary Christmas tree; others, as a secondary tree — just for the extra stares and attention. Whatever your motivation, you can’t deny that an Upside Down Christmas Tree is certainly a non-traditional way to celebrate Christmas. And hubby and I are all about being non-traditional at traditional times! Looking at the sales of Upside Down Christmas Trees — this year over last year — this appears to be an increasingly popular way to decorate for Christmas. It’s a novelty item for the person who has to have every new gadget available. It’s a great way to fit more presents under the tree! It’s practical — takes up little-to-no floor space, so its great for smaller apartments & tiny rooms, and can be positioned in tight corners and other places that do not accommodate a traditional Christmas tree. It’s a safer way to decorate for Christmas — keeping curious toddlers (and pets!) away from the delicate ornaments and lights. It’s that one new “thing” that the person who gets WAY too into holiday decorating can add to their collection. It’s easier to see the ornaments and decorations on an upside down Christmas tree because they hang away from the branches and do not get lost in all the foliage. It’s a great way to get attention — you’ll likely be the first on the block to have an upside down Christmas tree! It’s a conversation starter… you’ll have plenty to talk about when your holiday guests begin arriving! 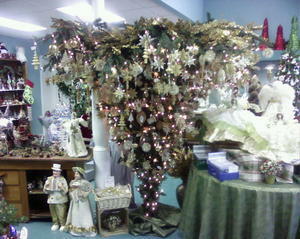 How Stable Are Upside Down Christmas Trees? A) How do you secure it into place? B) How do you prevent it from tipping over? Turns out, the weighted base provides extra stability to prevent tipping and leaning — whether you choose to rest it firmly on the floor, or secure it to the ceiling. If you decide to attach your Upside Down Christmas Tree to the ceiling, you may need to be creative with that spot after the holidays. Either you’ll want to hang something else in the same place, or find another creative use for the tree’s base/bracket if you choose to leave it secured to the ceiling. Upside Down Christmas Trees are available “pre-lit” (eliminating the need to string lights yourself) or “bare” (allowing you to decorate with lights as you see fit). While they’re still somewhat difficult to find, it appears that Hammacher-Schlemmer’s pre-lit model is a best-seller this year. They sold out of their first batch for the season, but more are just around the corner.